Last Saturday, I hosted a spa party at a Mary Chia outlet (Clementi Mall, Singapore) for my friends, family and some readers. It was part of the Singapore Blog Awards 2012 – Laced Ivory is one of the top 10 finalists under the Best Beauty Blog category – and Mary Chia sponsored S$300 for it, which I used for food and a little decoration. To sum it all up, I had a spanking great time! But let’s start from the beginning. I took quite some time in the few weeks before the party trying to plan for it. The first and most important thing was to compile the guest list, which was supposed to be between 10 – 25 people. The second most important thing? Of course it was food! All parties must have yummy food so everyone will be full and happy! Discussions with my sister led me to check out Daiso, where I managed to get some deco items. I also decided on Delifrance for finger food and Baked by Lace for cupcakes! To add to that, I had a get-together dinner at a friend’s place in the evening and I would be busy in the morning just before the party, so I wouldn’t have been able to do any last minute changes if anything arose. In my mind, I was HYPERVENTILATING. Time was definitely not on my side. However, I soon found that there was nothing to be worried about as everything went about really smoothly at the party itself! The theme for the day was “Nautical” and I managed to source some nautical looking knick-knacks to create the setting of a cruise ship. To be honest, there wasn’t much to prepare because the interior of the spa outlet already looks like one. Check it out! The little signboard I bought from Daiso, personalised by my sister. This was placed at the counter so my guests knew they had come to the right place! 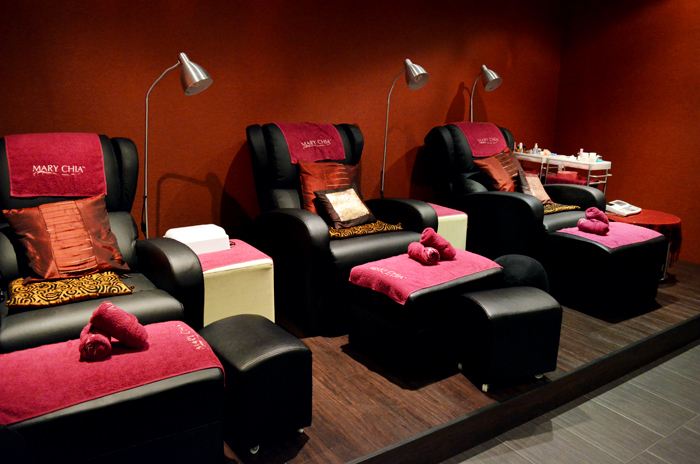 Comfy seats for gelish manicures! Got the beauty cabin feel yet? I hadn’t mentioned this, but Mary Chia sponsored all my guests a 30-minute treatment each and they could choose between an Eye Revival Therapy, a Tension-Relief Back Massage, an Express Gelish Manicure and a Contouring Therapy (tummy, thighs or arms). It was so awesome! All my guests came out of their treatments with only praises and looked glowingly radiant and relaxed. Some of them even fell asleep in that 30 minutes! We had a main room where the food was placed and people mingled around when they weren’t having their treatments done. I think the room itself is normally used for couple spas and stuff, because it has a bath tub, a nice vanity table and houses two spa beds. The bath tub that proved a hit with all of us girls! This totally made the “we’re-on-a-cruise-ship” come alive. The wooden box was later filled with thank-you notes and words of encouragement from my guests. Food from Delifrance. These were the yummy assorted French pastry tarts. Mini croissants with assorted fillings that weren’t really mini at all. Customised red velvet cupcakes that proved to be another hit with the guests! There were also other types of food like sandwiches and quiches. Mary Chia also sponsored free ginger tea, date tea and water for everyone. The last thing I had to prepare was the mini makeup cabin for my guests to doll themselves up after they’ve had their faces cleaned bare from the treatments, especially those who had chosen the Eye Revival Therapy. I brought my own Makeup Forever brushes, a bottle of brush cleanser, tweezers, tools and whatever makeup I had in my own stash, which I thought suited the nautical theme. I call this The Beauty Makeover Cabin Counter. There was makeup from Chanel, Makeup Forever, NYX Cosmetics, Clinique, E.L.F. Cosmetics, L’Oreal, Physicians Formula, M.A.C., Pop Beauty, Estee Lauder and more! There were falsies too, so the girls could try them on and get va-va-vroom peepers when they walked out of the spa. This was the cabin where I had the most fun because I got to bond with the girls over makeup. It was also the cabin where we made the most noise! In my next entry about the spa party, there’ll be pictures of my guests and things that went down. I’ll also feature the goodie bags everyone went home with. Some freebies were from Hoyu and Vanity Trove, who very generously sponsored cute hair dyes, lip crayons and B.B. creams! You’ll definitely read about them in the next entry. Stay tuned! Vintage Vespa via The Italian Cut. Laced Ivory X Mary Chia: Prelude to a Spa Party was last modified: June 18th, 2012 by Roxanne C.